Hertford Cake Co is an independent bakers offering various bespoke celebration cakes. 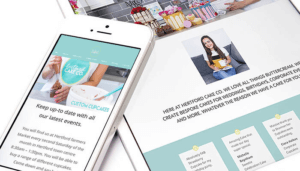 We helped them increase their online presence which had previously been achieved through Facebook and limited website presence, they now have a vibrant but functional website. There were a number of practicalities that we needed to incorporate into our solution, easily updatable news sections and an area with login area for the client to update their own products.